The Harry S. Truman Chapter Color Guard Team participated at the Awakening Ceremony on Sunday, October 3, 2010. MOSSAR Color Guard member Captain James Scott also participated in this event, but is not shown here. Shown here along with the Harry S. Truman Chapter Color Guard team, is Compatriot Dale Edwards, who assited with the SAR Recruiting Booth. Additional members who also assisted with the SAR Recruiting Booth, but not shown here are Compatriots Jim Nail and David McCann. It is estamated that over 50,000 people attended this event over the four day period. Left Photo (L-R): Major General Robert L. Grover, MOSSAR Color Guard Commander; Compatriot Dale Crandell; and President Dirk A. Stapleton, Harry S. Truman Chapter. 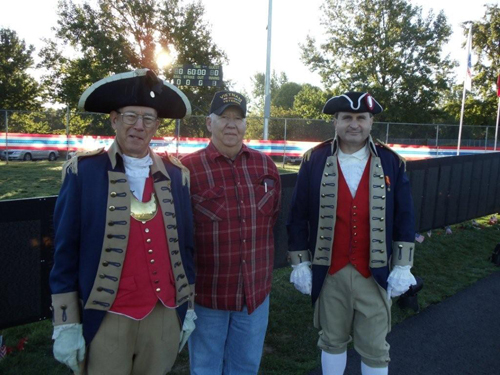 Right Photo (L-R): Major General Robert L. Grover, MOSSAR Color Guard Commander; and President Dirk A. Stapleton, Harry S. Truman Chapter.